The opportunity: Do what matters. Do Less. Achieve More. Successful business leaders set a clear vision, and then prepare coherent plans to achieve their aspirations and lead their team to successful delivery. Planning turns business vision, strategy and operational plan into action and cash delivered. “Vision without action is a dream. Action without vision is a nightmare.” A vision, a purpose of the will, is but a dream without the power and means of implementation. Action without vision and a coherent framework will waste resources and energy. Planning turns your Vision and Strategy into Action. 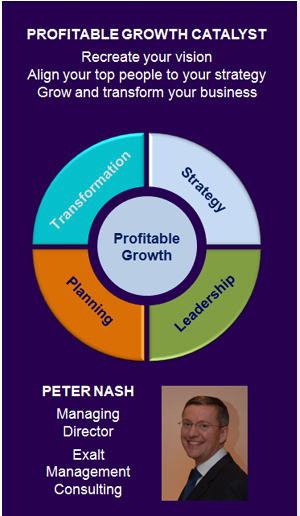 The objective of strategy-into-action is to work with the core leadership team to define a coherent plan to drive a successful change in the business to achieve the Vision and Strategy. The key is to explicitly focus on high value programmes which will deliver the required results. “Do what matters” requires you to define and identify the programmes and projects required to achieve the vision and strategy, and to prioritise overall programmes and projects to minimise investment and to maximise value around an integrated journey plan. In parallel to aligning the leadership team, this is the time to identify and appoint a wider group of people accountable for implementing the different programmes. “Do less” requires you to prioritise overall programmes and projects to minimise investment and to maximise value. Draw a line below which a programme will be closed – something which is much easier said than done! In addition, there is a need for headroom to grow. Each person and part of the programme needs to have sufficient ‘headroom’ (spare capacity) to re-think, re-organise and to identify strategic and tactical improvements to achieve even better results. It is this capacity which keeps a foot in tomorrow.